I slip into my silent, dark house, shedding wet running shoes and jacket. In the kitchen, I pour a cup of coffee from the pot I made earlier and microwave it back to life. I look out at the snow-coated trees in my backyard. I’ve had breakfast (admittedly, half a bagel with peanut butter eaten in the car), drove to a snow-slicked sledding hill, run up and down it about four times, and drove home. I can’t believe it’s only 7 a.m.
Upstairs, my husband is still sleeping. I rub the damp hair at the nape of my neck—a shower will have to wait. The uninterrupted silence is precious. 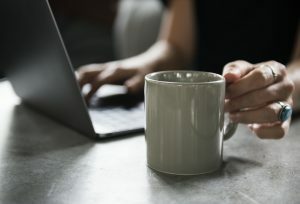 Grabbing my coffee, I head for my office (our spare bedroom) and get to work. Two hours later, I have gotten more done than I often do in twice that amount of time. There is something about rising early—those early morning hours can be incredibly productive for me, especially if I start with a run. Oddly, it makes the rest of my day more productive. Today’s workout was harder than last week’s hill run, because the hill was coated with a slick of ice and snow. But together, we ran, laughed, sweated, and began our day. Training for this marathon is slowly turning me into the type of person who gets up at 5 a.m. Not every day mind you—an often overlooked key to marathon training is getting enough sleep to allow your body to recover from difficult training. But it is making me a more disciplined person. Coffee tastes better after a long run. 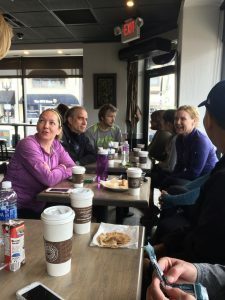 This weekend, I will again rise early in order to start a 16-mile run (again, with my running pals) at 6:30 a.m. It’s not easy to get up and run long runs, but the joy I feel when we’ve finished, and we’re drinking lattes at the local coffee shop, is worth it. There’s been plenty written about the power of getting up before dawn. From Ben Franklin’s “early to bed and early to rise” proverb to the studies and books like The 5 AM Miracle, plenty of folks make a solid case for getting up early (though it’s been widely debated). 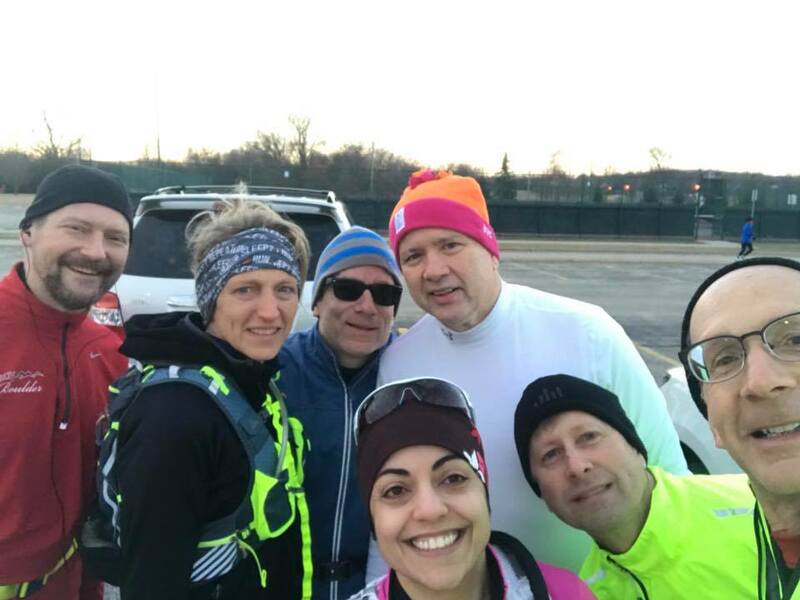 Some of my running pals are hitting the pavement (or treadmill, or track) by 5 a.m. every day. They are amazing. And they go to bed early! Discipline is daily. It is the small daily decisions we make that help us to achieve the big goals in our lives. But how does one become not just a person that thinks getting up early is a great idea (for other people), but a person who actually does get up and at things before the sun rises? In other words, how can we be transformed? If we want to become the kind of person who gets up at 5 a.m. to exercise, we have to start by getting up at 5 a.m. Which often means going to bed way earlier than you normally would (do the math: to get 8 hours of sleep you’ve got to be tucked in by 9 p.m.) We have to decide ahead of time to just do the small, daily things that will bring about change. Strategies only work when you put them into action. And big actions begin with small, simple ones. Like going to bed earlier, if I plan to get up earlier. Like eating healthyish food to give me energy. Like having a running schedule. And coffee, which you may have picked up on as a theme in this post. Dallas Willard said if we want to be transformed spiritually, we’ll do the things that Jesus did. Not just the things he did in public, but the unseen, seemingly simple, daily disciplines like prayer, fasting, solitude, generosity. We can’t just try to act like Jesus when we are “on the spot” in a difficult situation. We must train by living as Jesus did—spending time in prayer and solitude, for example. By adopting his habits and lifestyle, we’ll become the kind of person for whom Christlikeness is second nature. I often talk to people who say they want to write a book. I ask them what they are working on, writing, right now. They look blank, and admit they haven’t started actually writing. And they’ve never really written anything except term papers before. They just would like to, and will, soon. They would like to have written a book. Unfortunately, the only way to get there is to write. You cannot be a writer without writing. If you want to write a book, start writing: little essays, blog posts, journal entries, something. Put words on a page, simply as practice. Do it each day. Also: read. A lot. Our Big Sur group meets for an early morning run. In the same way, I can’t just show up at the marathon, which is now a little over seven weeks away, and just try to act like a runner. I’ve got to live like a runner now, each day. By running. Or going to the gym. Or sometimes, getting up early to meet friends who motivate me. 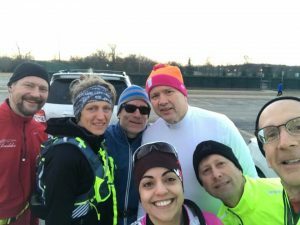 Every time I do, I am transforming myself into the type of person that runs up hills at 6 a.m. And who will run up them in a race that begins at 6:45 a.m. on April 29. You may not want to be the type of person who runs, especially early in the morning. But what type of person do you want to become? What simple practices do you need to do to become that person? Or 4:15 am. Committing to the time is part of committing to the process.